Moderate, hills can be difficult. This new Avalonia Conservancy property is large and sprawling offer several miles of trails. The longer blue blazed trail follows the perimeter of the property whereas the yellow blazed loop is shorter and explores the inner parts of the preserve. The red blazed trails serve as access and exits to and from the preserve. Do note that a portion of the blue trail has not been blazed yet pending finalization of land acquisitions and is expected to be completed in the autumn. For this hike, guided by a member of the Conservancy, we explored the eastern portion of the preserve utilizing a little of each trail. Starting from a small parking area at the bend in Miller Road we first followed the red blazed trail. We soon came to a marker for the blue blazed trail and continued ahead. The yellow trail comes in from the left and shortly thereafter we turned to the right to continue to follow the blue blazes. The red and yellow blazed trail continues ahead and we would return from there. The blue trail, named the Wapayu Trail, then starts a steady climb up the first of several significant hills on the preserve. We passed several walls along the stretch that are believe to be of Native American origin. These are known as serpentine walls that twist and turn like a snake with a boulder at the end of the wall as its head. As the trail climbs over the hill and descends we came to the next trail intersection. Here the yellow trail (Fenway Trail) joins the blue blazed trail once again. This is also about where we entered Griswold. From here we followed the double blazed trail passing beautiful outcrops. Ahead the trails split again. The yellow blazed trail veers to the left and the blue blazed trail turns to the right sharply and climbs up another significant hill known as Rixtown Mountain, also known as Wapayu. Along the trail on the long steady climb we passed several cairns, several outcrops, and a vernal pool. (Note: that at the time of this hike the trail was blazed only with survey flagging and will be blazed by the autumn). Near the peak of Wapayu is a small rock formation along the trail. From here the trail descends and winds passing several impressive stone walls and an old quarry before traversing the northern reaches of the preserve. The blue trail once again joins the yellow trail for a bit as it crosses an area known as Oak Alley. The trees are very large and old along this stretch with an outcrop and stone wall on the left. The yellow and blue trails split once again to rejoin at the bottom of the hill. Follow the blue blazes down the hill and then back up another small hill, once again rejoined by yellow blazes before passing through a cairn field. The trail then turns sharply to the south following a babbling brook that we crossed just before an old stone dam at the edge of Lost Pond. The trail then climbs back uphill catching glimpses of Lost Pond on the left. We ignore a red blazed bypass trail on the left and continued straight. A little further the blue and yellow split one last time. We stayed on the blue trail climbing over a hill passing more cairns and entered Preston. At the next trail intersection we turned left onto the red blazed trail. It is an access road that runs south to the parking lot. For the remainder of the hike we followed the red blazes back into North Stonington passing an occasional outcrop. The red blazes are once again joined briefly by yellow and blue blazes before exiting the property. A map of the property is currently posted at the parking area. Also be sure to bring plenty of water. This hike can challenge your stamina. Thank you to Carl Tjerandsen for leading this hike! Opened in September of 2017, the Samuel Cote Preserve is one of the newest trail systems in the area. The preserve is rather small and offers a great view of Spalding Pond. The entrance is along Clarks Falls Road and the parking area is a few hundred feet along a laneway on the left. From the parking area follow the laneway passing a large corn field on the right. Soon is a sign on the left for the trailhead. The blue blazed trail winds through the woods passing a massive white pine along the way. The trail comes to an old cart path called River Road. At each end of the road is private property. Please respect that and stay on the marked trail system. Turn right onto the cart path and follow it along Spalding Pond. There are several spur trails that lead to a trail that runs right along the shore. Back on the cart path you will see a sign for Trail 2, still blazed blue. Follow this trail back to the laneway and turn right. This will lead you back to the parking area. Map can be found at: Cote Preserve. 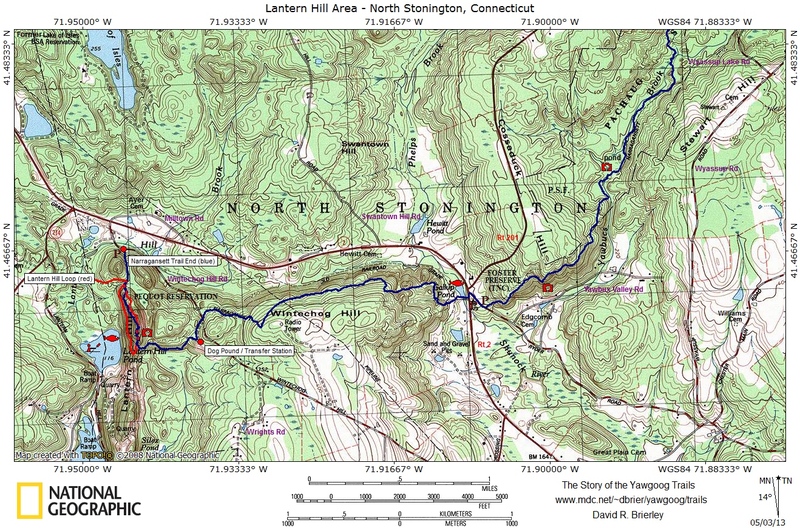 Lantern Hill is a must visit if you are in the southeastern corner of Connecticut. The hike described here climbs over Lantern Hill just southeast of the Foxwoods Casino complex and follows the Narragansett Trail. Starting from a makeshift parking area (with no signage) along Wintechog Hill Road the light blue blazed trail immediately begins to climb the hill following an old cartpath. After a couple hundred feet the trail levels off for a bit before coming to a red blazed Lantern Hill Loop Trail. Be sure to be aware of the blue blazes of the Narragansett Trail when you approach trail intersections. You will want to follow them and not the red blazes for this hike. The Narragansett Trail then starts to steadily climb the hill once again. The inclines are quite impressive at times. The trail first overlooks the Pequot Reservation to the north and west offering views of the casino and Lantern Hill Pond below. The trail then climbs over the summit to a stunning overlook with miles and miles of sights to the east and south. Clear days will offer a view of the Atlantic Ocean to the south. It is also interesting to see the hawks and vultures soaring through the sky sometimes below you. Use extreme caution along the edges here as a fall would surely be fatal. Also here on the first day of Spring the Westerly Morris Men climb the hill for their annual sunrise dance at the summit. The hill got its name from the War of 1812 as the hill was used as a lookout. When the British were spotted approaching, barrels of tar were ignited to warn nearby residents. After spending some time at the summit continue following the blue blazed trail as it winds, at times steeply, down the hill. There is one section, that we dubbed the Lemon Squeeze, that will challenge your footing, balance, and upper body strength. 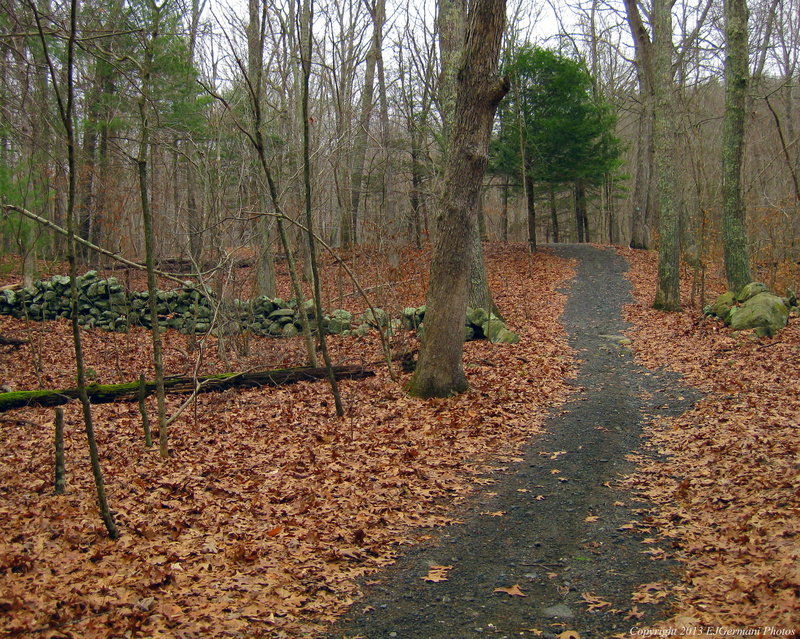 The trail then traverses the south side of the hill passing through groves of mountain laurel before coming out to the North Stonington Transfer Station. Again, be sure to pay attention to blazes and turns at intersections. After the Dog Pound the trail turns to the left through the transfer station and out to the road. At this point you have hiked 1.4 miles of the Narragansett Trail. The trail continues ahead, however it is closed (from Wintechog Hill Road to Route 2) at the moment because of logging. For this hike turn left and follow Wintechog Hill Road about a half mile back to the parking area. The View At The Top Of Lantern Hill. This preserve offers a short, blue blazed loop trail of just about a half mile that climbs up and back down a small hill. The property, directly across the street from 80 Hangman Hill Road, also has a small stream that you cross on a small boardwalk. The stone walls, however, are stunning as they wind up and down the hill. At the time of this visit it was a blistering 15 degrees in early March and there was not much to see of flora. A fellow hiker (Auntie Beak) had visited the property in the past and noted some of the springtime flora. Though short, the property would be nice to visit if in the area. Finding myself in eastern Connecticut this morning with more than enough time to kill I went seeking a relatively easy trail to walk. Actually a hike. Yes folks, the first hike since the injury. It was a short and for the most part level lollipop loop trail on the Foxwoods property. The trail is blazed very well with green markers and the beginning shares the trail with the Lantern Hill hike which I plan on doing in the future. The trailhead is well marked with signage behind the Two Trees Inn at Foxwoods. I came across some wildlife and saw several deer track. The frozen Lantern Hill Pond is near the end of the loop. Besides the lake I came across a cellar hole and a stream which was also partially frozen.